The world Hockey Summit brought 300 hockey leaders from around the globe together for four days of discussion on topics as wide ranging as Olympics, the growth of our sport and player development. The purpose of this event was to share ideas and best practices so that our global community can continue to improve hockey at every level. Then, during a break in the event, I tried to catch up on a few e-mails sent by our membership. With words of some of the top professionals in our sport acknowledging and endorsing our efforts still ringing in my ears, I received a particular e-mail that brought me a dose of the reality and challenges we face. I am amazed that people somehow believe USA Hockey wants to hold their children back. People need to understand that we take player development extremely seriously. USA Hockey wants more elite level players than ever before, and by elite we mean truly world-class players, not just those that add another A to their jacket by writing a bigger check and calling themselves elite. Just take our cross-ice hockey example. If this was not such a vastly superior environment for our kids at the Mite level to play, why would USA Hockey push so hard for this change? Why would the all the global hockey experts at the World Hockey Summit be saying the same thing? This particular parent is obviously passionate and certainly wants what is best for his or her child, but this e-mail exemplifies the challenges we face as an organization in implementing the American Development Model. As we enter our second full season, we will continue to emphasize cross-ice hockey, small area games and everything else that goes with creating the best system for our 8 & Under players. But if we are going to take credit for what we’ve accomplished to date, we also need to take the blame. We need to continually educate our parents and coaches as to why we are doing what we do, and judging from some of the comments we receive it’s obvious that we need to double our efforts to explain the benefits of long-term athlete development. To that end, every registered 8 & Under player as of Sept. 10 received an e-mail from USA Hockey trying to help explain our Red White and Blue initiative on cross-ice hockey. The e-mail re-directs you to ADMkids.com where we have a downloadable file that gives much more clarity to the why. I would encourage everyone who is curious to have a look. Submitted by womenshockey on Tue, 2010-11-02 12:43.
they don't know the game and the best shooter or puck carrier, controls the game , everyone else is trying to get the puck. it leads to frustration and the kid will quit or go to a program that has games , you see it the NHL guys who get sent to the minors because they dont know the game and there lost out there , Regardless of what any one says admit it , the rinks where losing money because there wasn't enough kids and with these programs you can pack them in ,collect at the door and the rinks love it. 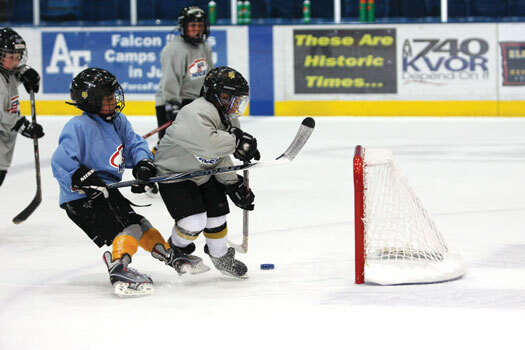 since we concentrate on the game and skills in a full ice rink we will always dominate , after all I don't think the game has changed in order to play an official game you have to play full ice, why would you teach playing on a third of the ice, when they get to squirt level they will not be able to play full ice with stamina , and they are behind in the early learning stage.